The Janus 360 from Drone Volt can carry ten GoPro Hero4 4K cameras to shoot hi-def video up, down and all around. One thing that can pull you out of even the most high-resolution immersive video experience is visible equipment: looking down and seeing the camera tripod's legs beneath you, or glancing over your shoulder and spying the rig holding the camera up. That's a problem even with video shot on Nokia's pricey Ozo camera, which at the sky-high price of $60,000 still cannot defy gravity. The Drone Volt Janus 360 can, though, at least for 15 minutes at a time, so immersive video shot with it really does give the impression of floating with no visible means of support. The Janus 360 is a quadcopter. It can carry ten GoPro cameras, five above its frame and five below, held on each end of a central stabilizing arm by two Freedom360 Mounts. When the drone is in level flight, the arm holds the cameras about 200 millimeters above and below the plane of the rotors. When the different camera images are stitched together, those rotors can be eliminated from the resulting video. The stabilizing arm remains vertical as the drone pitches and rolls, though, so depending on how the video is processed, viewers might catch an occasional fleeting glimpse of a rotor tip. See if you can spot one yourself as you look up, down and all around the 360-degree video below. 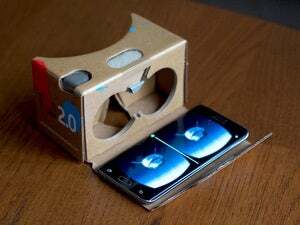 It's best seen through a VR headset, but the experience is almost as good using the YouTube app on a mobile phone with a Google Cardboard viewer. If you have neither, you can still view it on your computer, choosing in which direction to look by using the mouse or cursor keys. The Janus 360's frame is about 600 millimeters across, and the whole thing weighs a little under 5 kilograms, including the parachute. That's an essential component on a drone costing between €10,000 (US$11,250) and €15,000, and carrying around €5,000 of cameras. Drone Volt will launch the Janus 360 at an event near Paris on June 27 and expects to begin shipping it a couple of weeks after that, company chairman Dimitri Batsis said at the Eurosatory trade show outside Paris on Wednesday. 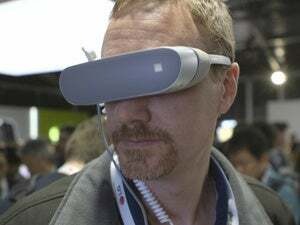 Batsis expects the Janus 360 to find use in VR game development and tourism, making the drone the odd one out at this show devoted to all things military. Not to worry, though: Drone Volt has another new product more in keeping with the show's theme: the Drone Spray Tear Gas, which does exactly what you'd expect. It's designed to break up riots and is safer than using tear gas grenades on two counts. For one, it keeps law enforcers away from the rioters, as it can be controlled from up to 6 kilometers, and for another, unlike a grenade, it doesn't explode, said Batsis. That means the biggest risk of bodily injury is if it falls on someone's head -- a possibility, as it can only hover for 16 minutes before needing to land for a recharge. It's also more accurate than lobbing a grenade: The onboard camera can be used to aim and, according to Batsis, the downdraft from the rotors helps direct the tear gas straight down.